Rattan garden furniture can be said to be the ideal material for patio furniture and garden seating. This is as rattan furniture is easy to clean and maintain. Not only that, rattan makes for a lightweight material. Therefore, moving your furniture is a fairly easy task, even the garden sofa can be moved with a fair amount of ease. We offer rattan furniture in many styles of outdoor furniture. These include patio sets, garden table and chairs, garden sofas and bistro sets. Not only that, our large collection of rattan furniture is available in different colour options. For instance white, brown, black and natural. This means there should be rattan patio sets perfectly suited to your garden style and your taste. Imagine being able to relax in the warm sun whilst still being comfortable. Alternatively, how amazing would it be to have an additional outdoor dining area where you could comfortably cater for all of your friends and family? BillyOh are proud to offer many types of rattan garden furniture, designed with you in mind. 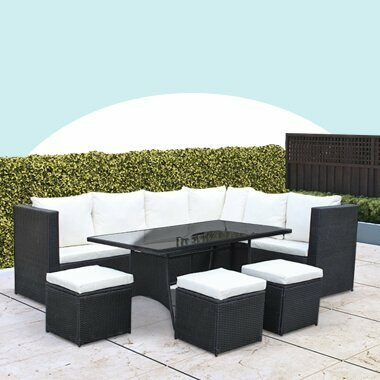 Additionally, rattan garden furniture sets are ideal for those looking for furniture that is suited to both indoor and outdoor use. Rattan tables and a seat dining set will not only be an efficient dining set outdoors, but indoors too. Even our outdoor sofa rattan dining set could be convenient conservatory furniture. Therefore, although seen as outdoor furniture to be enjoyed during the warmer months, our high quality rattan furniture can be used indoors during the cold months and the more horrible weather too.